William Hayward was born in 1642 and was buried on 14 Sep 1708 in St Lawrence, Little Wenlock. He is the father of Mary Hayward, the second wife of William Bendy (1653-1724). In the marriage bonds of February 1697 it states that she comes from Little Wenlock in Shropshire. The Hayward family were prominent landowners in that area of Shropshire since the middle ages. They reached the height of their wealth with Sir Rowland Hayward (1520-1593), who was a cloth merchant and Lord Mayor of London. Sir Rowland had two sons George and John, both knighted, and left an impressive list of property in his native Shropshire but also in London, Middlesex and Kent. Sir George Hayward died childless, aged 28 in 1616, and Sir John Hayward died also childless in Rochester, Kent in 1636 leaving estates to his sister’s children. With Sir John’s death these Hayward lines all came to an end. Sir Rowland was the son of George Hayward MP and the postulation is that William Hayward is descended form Sir Rowland’s brother, probably a William. This branch of the family regained the advowson of the parish church of Little Wenlock from 1623. Sir John Hayward divided and sold much of the Manor of Little Wenlock, acquired by his father on that date and ostensibly sold some parts to his cousins George and William. In “History of the County of Shropshire” (BHO) it records how this advowson passed first to George Hayward and then to his brother William Hayward by 1663, and on his death in 1708 to his son William who died in 1727. The will of William Hayward, Gentleman of Little Wenlock, is thus the starting point of establishing how Mary Hayward fits into the broader family. This will is written 6 Sep 1726 and he would appear to be the brother to Mary Hayward. Firstly it is witnessed by none other than William Bendy – this would be William Bendy Junior (1700-1782), Mary Hayward’s son, as his father died in 1724. The will does not mention any sisters but does mention a brother John and a cousin called Rowland Pudsey. 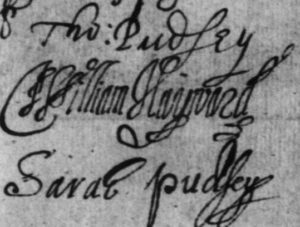 After William Hayward’s marriage to Mary Pudsey in 1665, the baptisms of his children appear in the Trysull register and not in the Little Wenlock some twenty miles to the north. The eldest son William, whose 1727 will survives, was baptized on 7 Oct 1666 followed by Mary on 29 Aug 1668. However, this Mary appears to be buried in 1670 when the register states that “Mary daughter of William Hayward, Gent was buried”. The later baptism of a second Mary cannot be found, nor can the baptism of her putative brother John nor the even more tentative sister Sarah. 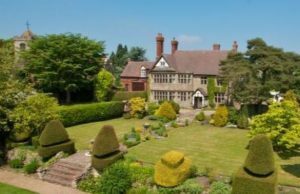 We know that William Hayward continued to have estates in Little Wenlock but the baptisms of his children imply he was absent for much of this time. It would appear that he owned the Old Hall (former manor house), Little Wenlock possibly acquired from Sir John in 1623, but it was his son who appears to have extended this building after 1708 and who was much more active in the Little Wenlock area especially extracting coal from the Coalmoor works that was shipped away on the River Severn down to nearby Coalbrookdale. William Hayward’s will has not yet been located.